If you follow AC Needlework on Facebook, you know I promised that new pattern releases were coming soon. 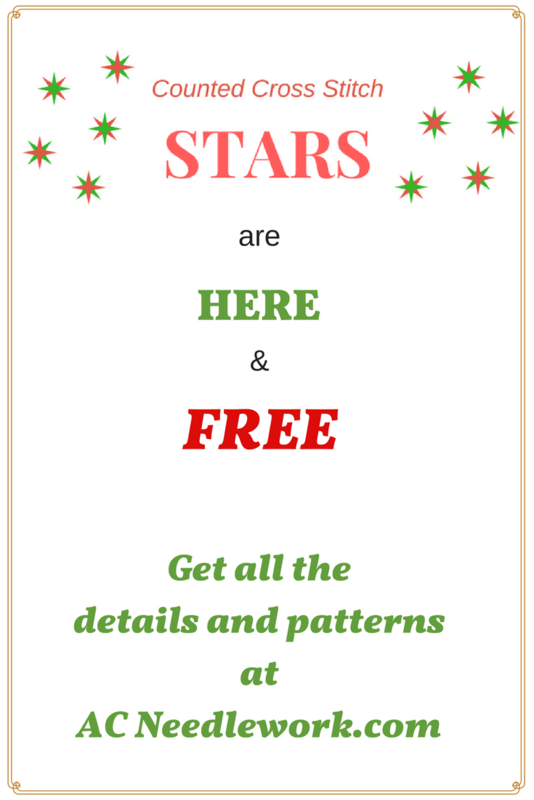 Well, I am happy to report that new Cross Stitch Stars have arrived at AC Needlework and better yet they are FREE for you in the AC Needlework free pattern gallery! Keep reading for all the pattern details and get some ideas for using these patterns. 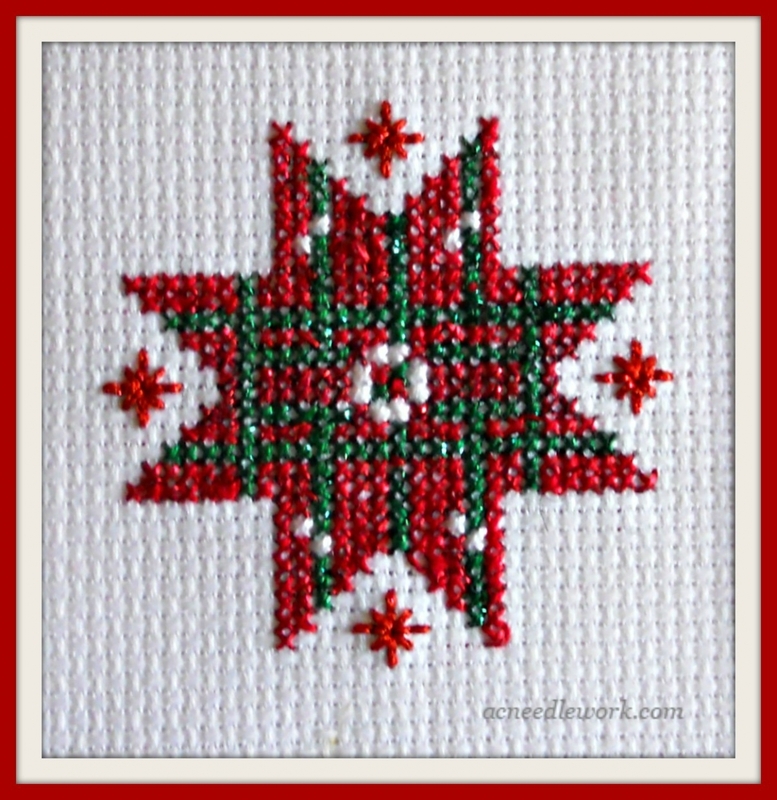 This Little Christmas Star was inspired by the red and green plaids that you see in many Christmas ribbons. While it is not an actual plaid, it does have lines of green in the red background and small hints of white. I used DMC floss with Kreinik blending filament. The addition of blending filament really makes this star sparkle. If you have never used Kreinik blending filament, you can find some tips in a previous blog post, “It’s Snowing At AC Needlework”. This is a small design. Stitches – 28 x 28; Finished size – 1.75” x 1.75” (4.4 cm x 4.4 cm). You will use 4 DMC colors and corresponding blending filament. As with all AC Needlework patterns, you will receive two 8.5 x 11 charts (one color and one black and white), a photo of the completed design and a chart of floss numbers and symbols for the pattern. 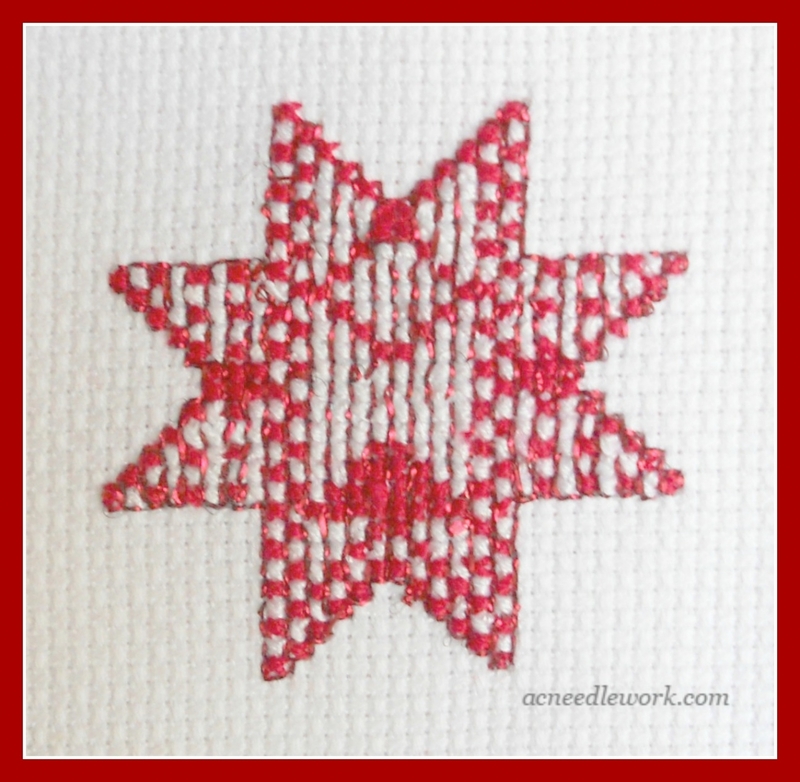 This star was inspired by a candy cane and a red and white checkered table cloth. (Don’t ask – my inspiration comes from unexpected places sometimes!) This pattern only uses 2 colors and works up quickly. The backstitching does take some time but it adds the checkerboard look to the pattern. This is also a small design. Stitches – 28 x 29; Finished size – 1.75” x 1.81” (4.44cm x 4.5cm). The pattern packet includes the same type of information as in the Little Christmas Star design described above. How Can I Use These Designs? Both patterns make great greeting cards. Why not make your Christmas cards unique? The patterns stitch up quickly enough to make more than one. The aperture cards pictured are from Craft Creations. Do you give jars of jam, jelly, or candies for gifts? 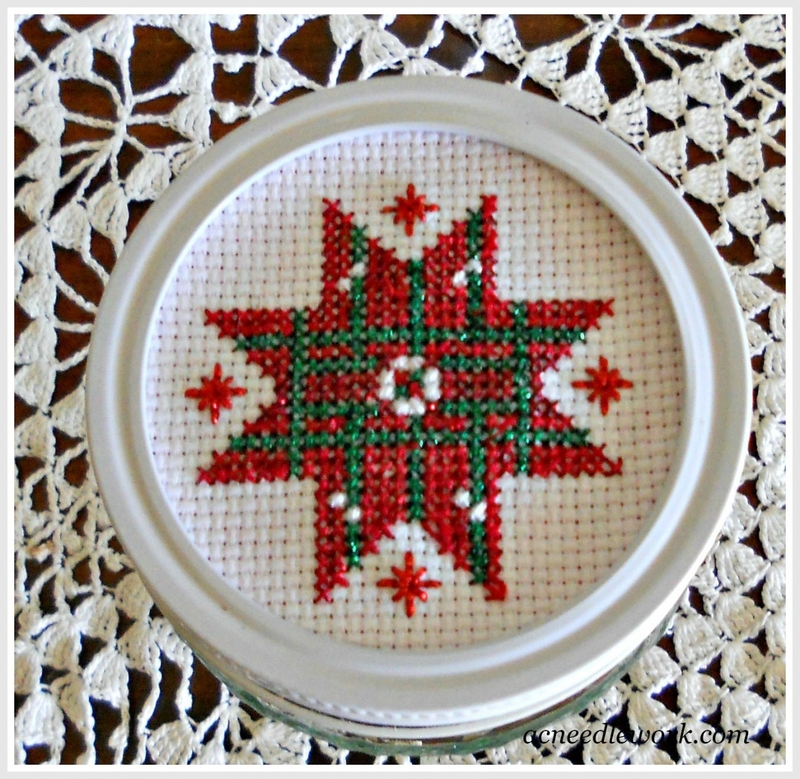 Stitch these Christmas stars to make your gifts even more special. These stars would also make pretty tree ornaments. Why not make stars for the specials ones in your life this holiday? After all, the patterns are free. If red, green and white don’t fit into your holiday themes; change the color ways to your favorite colors. I hope you will enjoy making these designs. 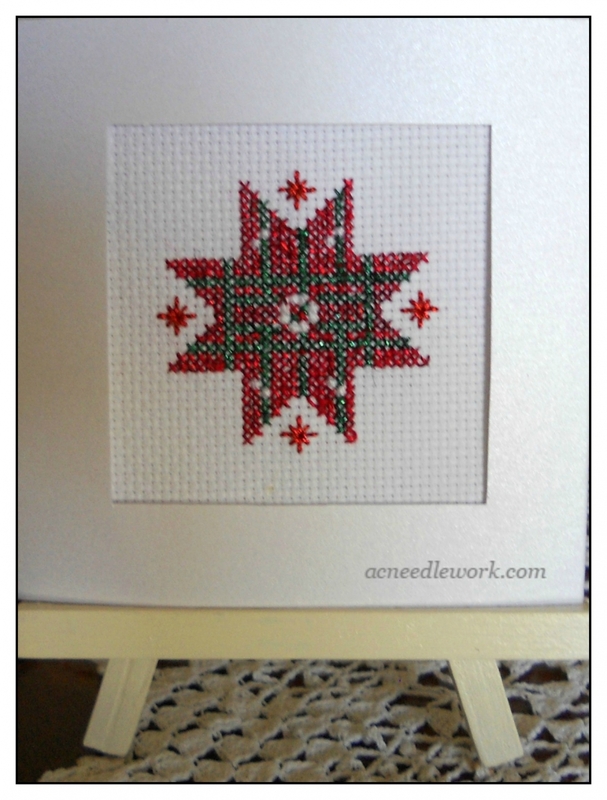 Do you have a favorite star counted cross stitch design? Tell us about it or show us on the AC Needlework Facebook page. If you stitch one of the stars featured here, share your finished piece with us. 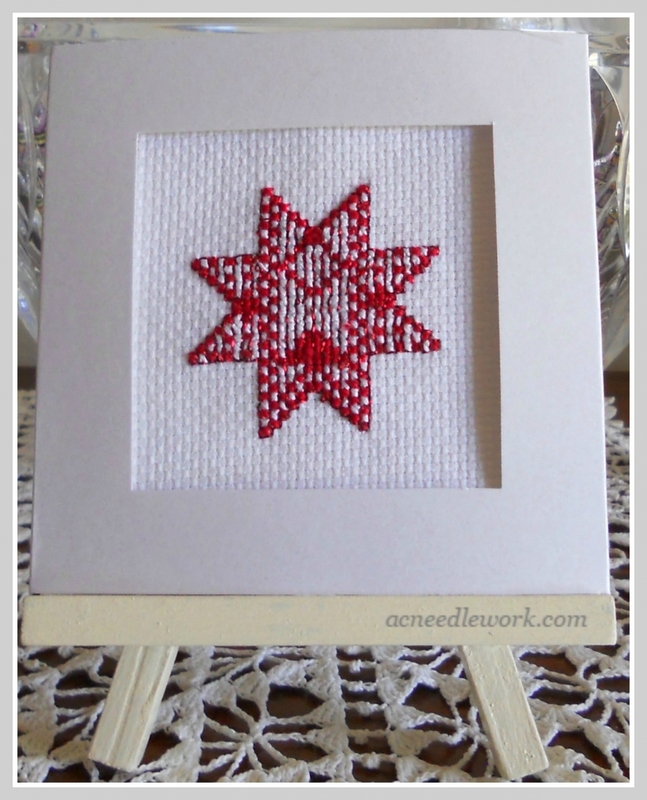 Upload a photo to the AC Needlework Facebook page or leave a comment here. You may also enjoy these related designs! Subscribe to our email list. Get tips, announcements, updates and a free design. Won't you share with others you know who may be interested?